Make 9-Month-Old Shrinika Fight Cancer. My name is Rajarajan, relative of Paneerselvam. I have created this campaign on behalf of him. She was the bundle of joy filling the house with her gurgles and giggles until recently when she was diagnosed of cancer. Life sometimes is unjust and harsh. It pained me to see the anguish this baby girl was going through for no fault of hers. And through your support, we can make her smile again and live a beautiful life like us. This is an earnest request to urge you to save the life of Shrinika, a 9 month old baby girl who has been diagnosed with Lymphoma ( Lymphoma is a form of cancer that affects the immune system - specifically, it is a cancer of immune cells called lymphocytes, a type of white blood cell. ).This family hails from a low-income background and do not have the means to spend for the treatment. The father is a daily wager, who has not been able to go to work due to the hospitalization of his child. The cost of the initial phase of the treatment costs 3 Lakhs and the estimated total cost of the treatment comes to over 10 Lakhs. The details of the treatment and the hospital records are attached for you. Kindly contribute to help save the life of this innocent child who has a long way to go in her life. Whatever you can donate will be welcomed and received with deep appreciation for your support. We all came together to help Shrinika. Your support ensured she received treatment as planned. She was recovering well and was discharged. But things took a turn when her condition started to deteriorate again. She was admitted to the hospital for immediate care but despite all efforts, she couldn't be saved. With a heavy heart, we would like to inform that Shrinika is not with us anymore. Her parents were not in a position to talk as it came as a shock to the family. However, we were able to speak to her father the other day. He said the family is still in shock. "Atleast we were able to provide her treatment and we will never forget the support we received which helped her till her last days", he said. Our prayers are with the family. May her soul rest in peace. I am Uthra Nagarajan, an Open Fellow with Milaap. I met Shrinika and her parents recently at Apollo Speciality Cancer Hospital, where she is getting treated. Shrinika, now a 1-year-old, was alert and playful that Monday morning. She has had two sessions of chemotherapy in the last two months. Shrinika has been responding well to the treatment plan and her doctor has suggested a bone-marrow transplant (BMT) in the coming months. 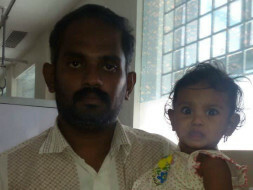 “Her next session of chemotherapy will be quite intense,” said Paneerselvam, Shrinika’s father. “After that, she will undergo a bone-marrow transplant which will hopefully cure her.” A session of chemotherapy usually lasts a few days; if Shrinika copes well, she will get discharged in 5-6 days. If her energy levels are low, then she will take around 10 days to go home. The family, which hails from Namakkal, has been living in rented accommodation in Alwarpet for the last five months. They spend around Rs 10,500 per month on rent and food. Paneerselvam is an auto driver and his wife is a homemaker. The parents are readying themselves for the upcoming BMT and hope to see Shrinika healthy and happy again. I am Sudhakar, a Milaap Open fellow in Bengaluru. 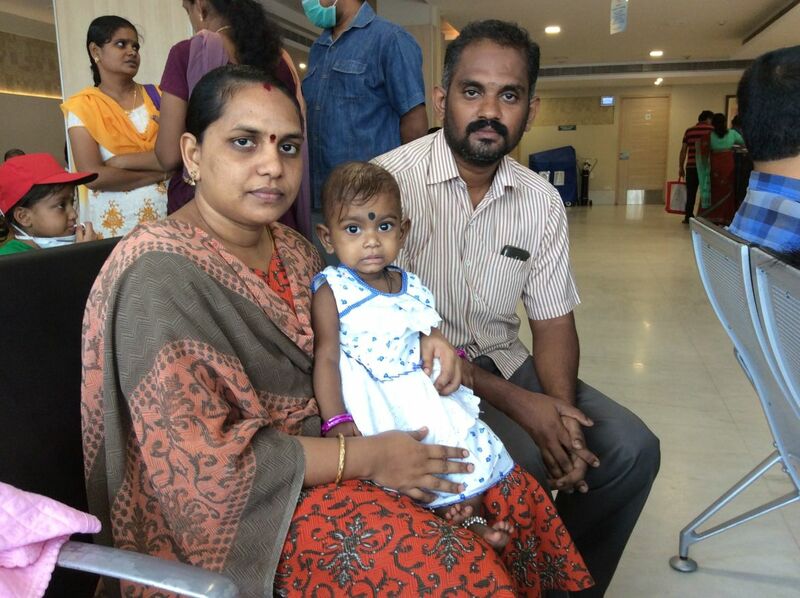 I met Shrinika and her parents on 25th July, Monday at Apollo Specialty Hospital, Anna Salai, Chennai. She underwent her last chemotherapy session of the 1st protocol between 17th - 20th July. Lymphoma is a very rare disease at her age. Shrinika was first taken to CMC hospital in the month of May, where the treatment was not possible because of lack of facilities. 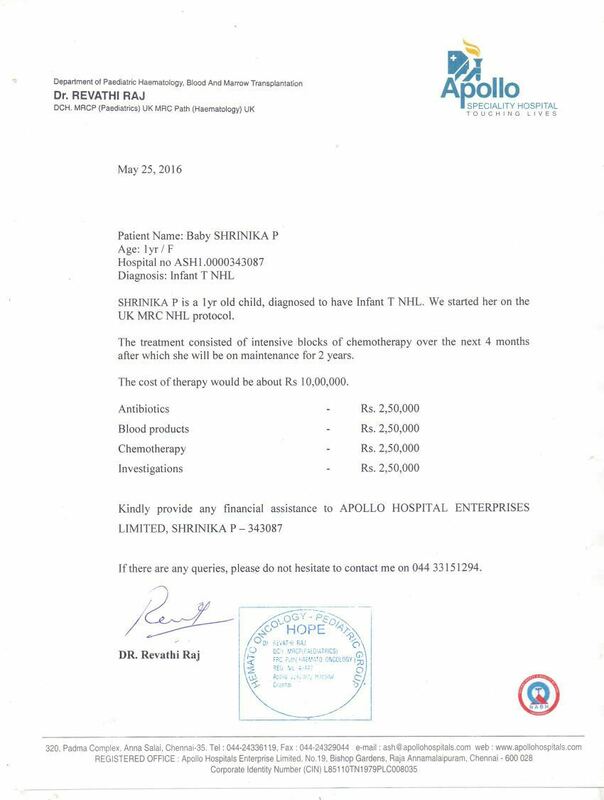 Shrinika was admitted to Apollo Specialty Hospital on 2nd June. 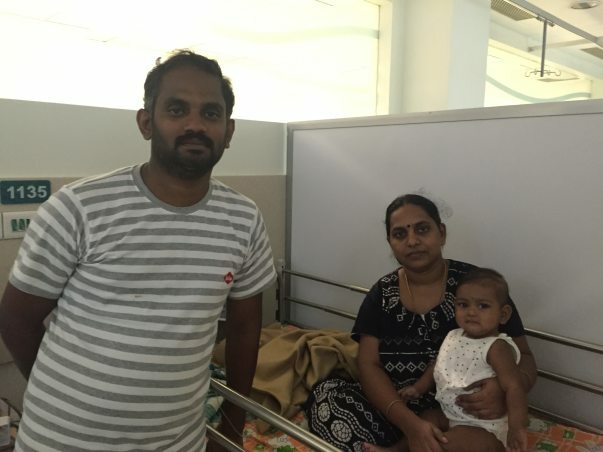 Shrinika’s father, Paneerselvam said, “The doctors have said that the MRI scan taken at the end of the 1st protocol shows that the cyst has reduced by 75%.” There are 5 more months of treatment pending. 1 protocol is approximately equivalent to 1 month of treatment.